CAMERON White says fixing the little things could be the difference between Melbourne Renegades finishing the Big Bash season as also-rans or champions. The Gades host the disappointing Hobart Hurricanes on Thursday night and have lost seven of their past eight games at Etihad Stadium. Emerging star Chris Tremain was dropped on Wednesday, paying the price after captain Aaron Finch smashed his side’s powerplay bowling against Sydney Sixers as “poor”. The 2-3 Renegades have twice been defeated in the final over, and White said they weren’t far away from clicking. They have not lost to Hobart since 2011-12. “In two or three overs here or there we’ve just been off,” White said on Wednesday. The Renegades are extracting belief from Sydney Thunder, which last season travelled the group stage 4-4 before seizing the trophy from fourth place. 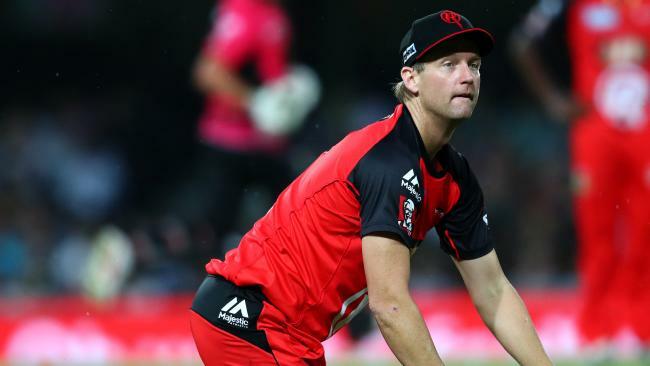 The Renegades are likely to require five wins to reach the semi-finals, unless Sydney Sixers falter in their final two matches. The red team travels to face Adelaide Strikers (Adelaide Oval) and Brisbane Heat (Gabba) next week. Strikers captain Brad Hodge has already labelled his side’s finals hopes “dust” while the Heat are likely to be without six machine Chris Lynn, who was selected in Australia’s one-day squad. White said playing more games would help establish a clearer top four. “In a short tournament you can’t afford to lose too many games. It’ll be interesting to see how the table works out at the end of it,” he said. The Herald Sun revealed last month that Cricket Australia was set to flood next summer’s calendar with more BBL fixtures — but not more franchises. White leapt to the defence of fragile fast bowler James Pattinson, whose economy rate of 12.31 is the second-worst in the league.